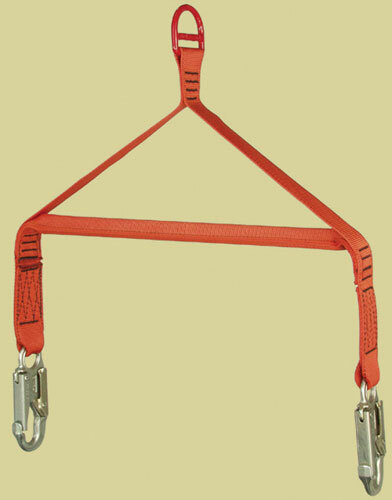 Use this guide to help make selection of a rescue harness. The ultimate in comfort and protection!! 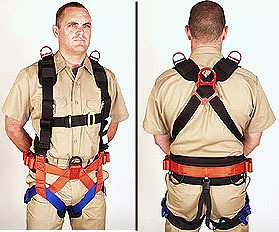 PMIs AVATAR harness is the most comfortable, versatile work and rescue harness on the market today. At only 5lb 15oz, it is lightweight and includes a functional and practical variety of attachment points for any work/rescue application: sternal, dorsal, waist, shoulder, and rear waist belt... PLUS side attachments for positioning. Ergonomic design puts safety first without compromising comfort. Adjustable leg loops and waist belt are extra wide and padded. Includes storage/carrying bag. UL Labeled to ANSI fall protection standards and NFPA 1983-1995. 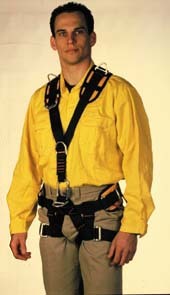 Standard Size: waist 30-38" thigh 19.7-25.6"
Large Size: waist 36-55" thigh 23.6-29.5"
Unique harness certified to meet NFPA Class II and Class III Harness Standards. 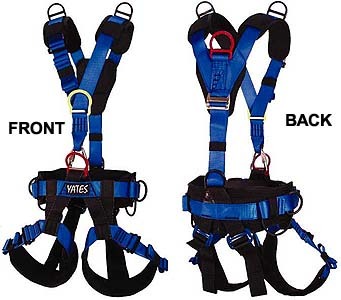 YATES Voyager Harness is designed to meet the demands of the Rescue Professional who needs a versatile harness with multiple attachment points. Yates New D-Ring allows the rescuer additional space for multiple connections to a single attachment, without adding excessive bulk. Voyager Harness allows for attachment at the front and back of waist, chest, shoulders and hips. 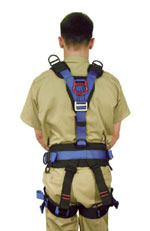 The waist and seat portions of harness are easily separated to convert the harness from a Class III to a Class II. 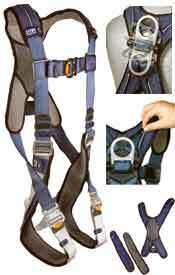 Harness is easily donned and adjusted using ''New'' custom made ''CAMLOCK'' adjuster buckles. This unique buckle adjuster offers an exceptionally high release angle thus eliminating any chance on buckle slippage. Certified in accordance with NFPA (1983/2001 Edition). 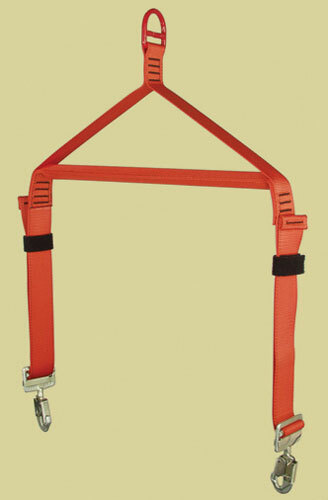 Meets ASTM/ANSI/OSHA requirements for Class III Harness. 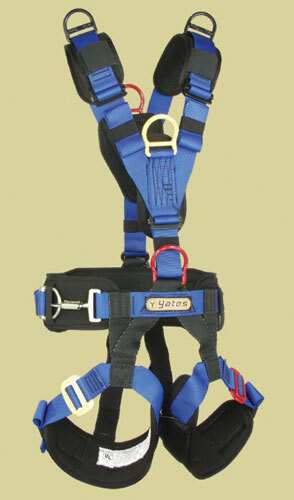 The same design as the Non-padded Heavy Rescue Harness with the added comfort of a 4" waist and 3" leg pads. The pads are designed to maximize comfort and minimize inconvenience when using in tight spaces. Features a rear clip-in point between the shoulders, D-rings on top of the shoulders to allow the use of a spreader bar system, forged color-coded two piece (quick connect) leg & sternum buckles for easy donning, forged D-rings for main attachment points (5,000lb proof-load). Color: Orange with black pads. Weight: 80oz. Used by many agency personnel for short haul, rappel and extraction (SPIE) operations. All webbing and hardware colored black. Two piece quick connect buckles on the legs, waist and sternum. Redesigned in 2004 to meet FAA TSO approval for use as a short haul harness. With the addition of shoulder retrieval D-rings on this standard vest style harness, it is ideal for rescue applications but also can be used for fall arrest and restraint. 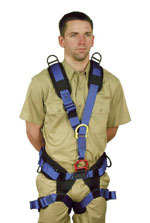 Every DBI/SALA harness combines maximum comfort, freedom of movement and ease of use without sacrificing safety. All harnesses are designed to securely retain you in case of a fall and distribute the impact forces throughout your body. Our exclusive Patent Pending Delta No-Tangle design holds the shape of the harness, adding to your comfort, and making it easier to put on. Whether you wear a harness 4 hours a day or 14 hours a day, it needs to feel good and fit right for optimum comfort, safety and productivity. DBI/SALA harnesses are designed to fit you - no matter what your size or shape! ExoFit XP is a new generation harness providing all day comfort in a harness you can trust. The industrys first truly washable harness with removable padding. State-of-the-art 3-D mesh lining wicks moisture keeping you cool and delivering all-day comfort. Superior X design padding wraps around the wearer for the ultimate in no-tangle donning. Ergonomic design incorporates shoulder, hip and leg padding that always stays in place enhancing comfort and worker satisfaction. Soft edging moves with you preventing uncomfortable rubbing or chafing enhancing comfort and mobility. One-handed quick connect buckles make putting on, adjusting and removing the harness a snap and provide a memory fit  adjust the harness once and it stays that way. Built-in belt loops to support a SALA belt or one of your own. Torso buckles adjust easily, yet hold the straps firmly in place and complete the 5-point adjustment system. Soft, lightweight polyester webbing is strong without feeling stiff or coarse . Coated hardware for corrosion resistance. Size = Large (Small through X-Large sizes available). The ExoFit XP design is based on the concept of a single piece of material constructed in the shape of an X that wraps around you for the ultimate in no-tangle donning and comfortable security. From the moment you put it on, the ExoFit exceeds anything youve ever worn in a fall protection harness. The materials are soft and lightweight, yet extremely durable. The shoulder, hip and leg padding is built-in so it cant slip. The breathable 3-D mesh lining guarantees youll stay dry and comfortable every day. And the quick-release buckles are fast, efficient and totally secure! It even has a memory! Put on the ExoFit XP Harness, adjust it, and from then on it remembers the adjustment. The next time youre on the job, slip it over your shoulders like a vest, snap the three ExoFit XP buckles and youre ready to work. Its faster than putting on and buttoning up your shirt! 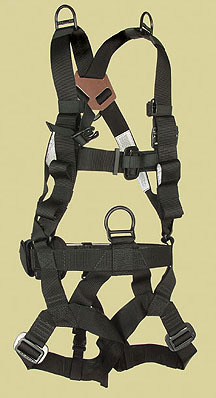 Every DBI/SALA harness combines maximum comfort, freedom of movement and ease of use without sacrificing safety. All DBI/SALA harnesses are designed to securely retain you in case of a fall and distribute the impact forces throughout your body. is made with 1/2 inch round Delrin® rod. closer to the high attachment point.